Right after that, Social Media Week descended upon New York City. The team at Social@Ogilvy organized a series of events in the Ogilvy NYC headquarters (affectionately called “The Chocolate Factory”). The panel I joined was all about mobile health and the intersection with social media. Interesting stuff that’s becoming more important in the pharmaceutical marketing space, as patients are using smartphones to manage their health. Dan Chichester hosted a lively panel with Andrea Hackett, John Nosta, and me. 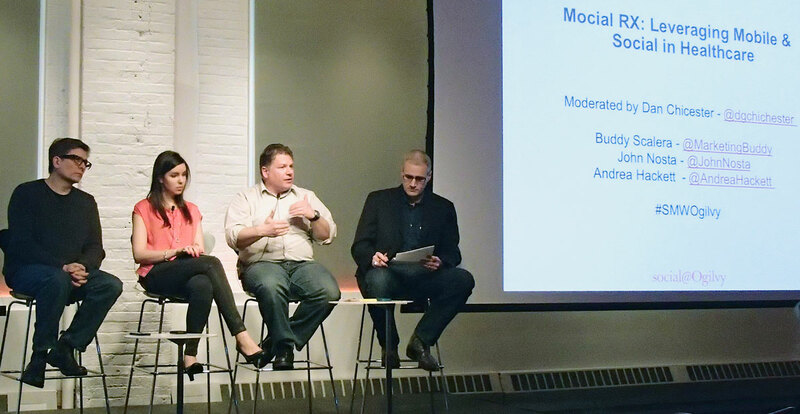 “Mocial RX: Leveraging Mobile & Social in Healthcare” was streamed live as a video. I haven’t watched it, but I’m told we did okay. DTC National 2013 is a healthcare and pharma marketing exclusive event. It’s a pretty impressive event with a good number of attendees, so there’s a lot of energy in the room. I’ve spoken on the big stage, which is fun because there are no other events running at the same time. This year, I got to participate on a different level. We did a workshop called “eDTC National Pre-Conference Workshop” on the first day with Gold Pass ticket holders. They had us guide some hands-on discussions and exercises related to content marketing. It was really interesting because it was two marketers from the brand side with Aurora Archer from AZ and Bill Meisle formerly of GSK. They talked about marketing from the brand perspective. Then we had two presenters from the agency side. Bill Drummy of Heartbeat Ideas and I workshopped from the agency side. 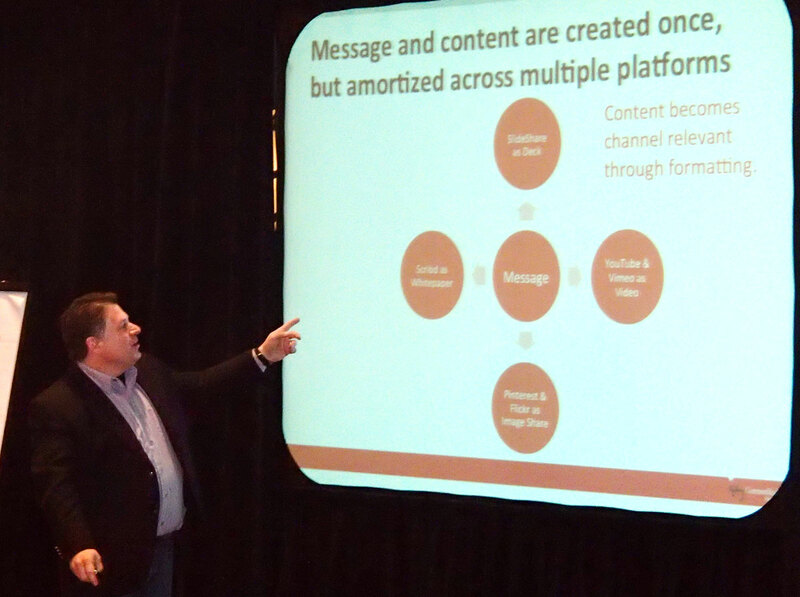 I presented examples of visual content strategy and how it is being included as a tactic in multi-channel marketing campaigns. June was my crazy month this year. My most offbeat event was BooksNJ 2013, which was held outside. It was this charming mashup of authors, musicians, artists, and book fans. You may not know this, but I’ve written and published 5 books on creativity and visual storytelling, so they were interested in me as an author. They had some really interesting panels and presentations. I got to participate in a panel with Ted Rall and Mark McKenna. The panel “Justice League and American Politics: The Graphic Novel’s Role in the Humanities” focused on real-world events and how they are reflected in graphic novel format. It was nice to kick back and talk about how you can tell relevant, emotionally charged stories in the pages of graphic novels. A lot of people are interested in visual storytelling, so we spent some time talking about how we translate abstract ideas to the physical page. 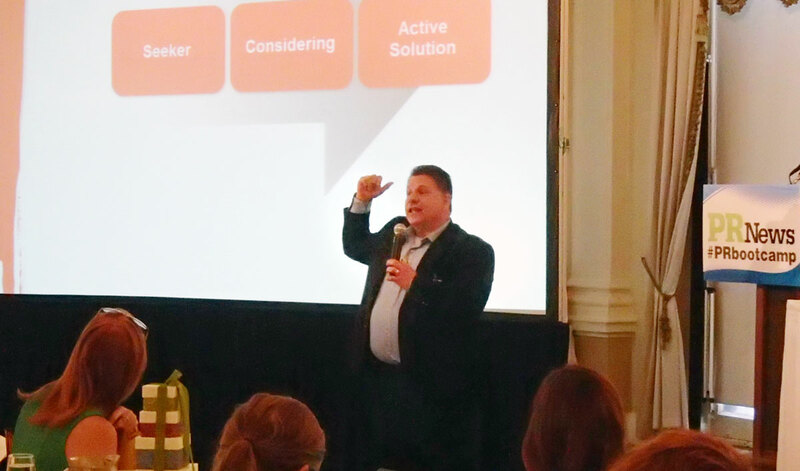 Buddy Scalera talks about the user journey and how it relates to public relations at the PR News Content Marketing Boot camp 2013. Public relations is related to marketing and we often work with our PR teams on integrated campaigns. So speaking at the PR News: Content Marketing Boot Camp was a natural fit. See my interview with the PR News organizers. This boot camp was focused on giving specific details about how to do content marketing. 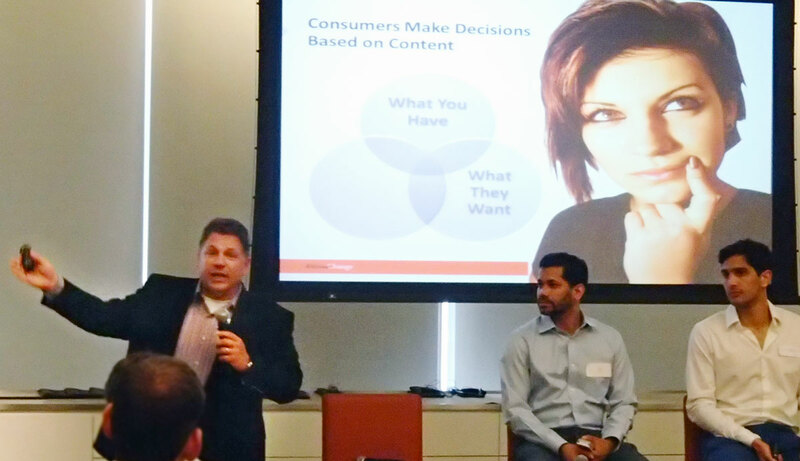 I was on a panel called “Show & Tell: Examples of Content Marketing That Works” with Ben Shields, Director of Social Media and Marketing at ESPN; Ryan Petersen, Editorial Manager at CDW; and Allison Steinberg, Senior Media Analyst at JetBlue Airways. The panel was really good because everyone gave an in-depth case study about how we’ve organized content marketing campaigns. I talked a bit about visual content strategy and the role of content in the user journey. It was interesting to see the way public relations creates, manages, and measures content compared to the way we typically do it in marketing. Buddy Scalera gives an introduction to a health panel by describing how patients make decisions based on content at Health 2.0 | Matchpoint East. Health 2.0 runs regional health, technology, and marketing events all over the country. The Health 2.0 – Matchpoint | East event is an event that takes it one step further with curated networking. Pretty cool stuff that connects healthcare entrepreneurs, companies, and technology. See my interview with the Matchpoint | East organizers. They had some interesting speakers who talked about how technology and social media are forcing changes in healthcare. Smart stuff from a unique angle. I was asked to moderate a panel with healthcare technologists and entrepreneurs. I moderated the healthcare-information panel “Consumer engagement: Translating health information for the general public” with Omar Haroun, Exec. Director Biz Dev, Greatist Inder Singh of Kinsa, and Matthew Holt of Health 2.0. This was a smaller, more intimate event that fostered networking and conversation among attendees. And then there was Content Marketing World 2013 in Cleveland. With 1,700+ attendees from 40 countries, this has become the go-to event for content marketers. It’s like the SXSW for content marketers. This is a stunning event that features the top speakers in the country from top agencies and brands. It’s a who’s who of content marketers. And me. If nothing else, they knew how to create an event with buzz. The entire town of Cleveland rolled out the orange carpet. At the center of it all was ringmaster and marketing legend Joe Pulizzi. I’ve read his books, so I really respect him as a thought leader, but he’s also a born natural on a stage. Plus, he provided a keynote from William Shatner. If you can believe, I got to speak twice and appear on a video roundtable. It was a pretty mind-blowing experience. On the first day (Sept 10), there was a content marketing video roundtable hosted by Karen Budell. It featured, Julie Fleischer, Michael Weiss, David Germano, Andrew Davis, and me. Karen Budell guided us in a productive, challenging, and often funny discussion about current state of content marketing. Next was my big day. On the second day (Sept 11), I delivered a brilliant and funny (my words, nobody else actually said this) presentation on visual content marketing. I talked about some of the ways we read comic online and what web designers can learn from comic book artists. I kept it light, breezy, but tried to share something useful that people could bring back to the office. The deck for “Top Seven and a Half Tips to Jump Start Your Visual Content Strategy” actually went (somewhat) viral on SlideShare. The presentation (designed with Ivan Ruiz) was actually featured on the SlideShare homepage and my ego became so large that it required a team of engineers to fit my head through doorways. People like the comic book stuff, so I’ll be pulling more of storytelling style that through other presentations. Here’s a link that will pull up tweets by me and about me from #cmworld. And I am @MarketingBuddy on Twitter. The third day (Sept. 12) featured the Content Marketing World: Health Summit, which was hosted by MedCityNews.com. This event was targeted at my vertical of healthcare marketing, so my presentation focused on the specific challenges of our industry. Again, I incorporated comics to demonstrate visually how we can screw up relationships by prioritizing our messaging over the content needs of our users. Specifically, if we just talk “at” people, we lose them. The comic strip did a nice job of illustrating that point. To keep it interesting, I framed the story around exploration and used Christopher Columbus and mythical sea monsters as examples. You had to be there. 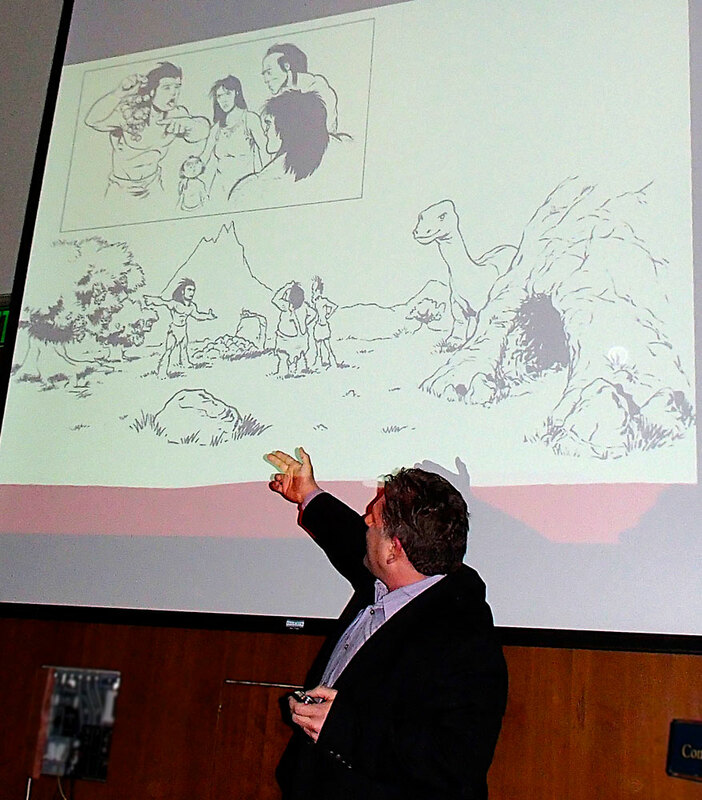 I’ll be hosting a series of educational panels at New York Comicon 2013 about creativity and visual storytelling. There’s also a networking event and an interview segment. Check out ComicBookSchool.com for an advanced look at my schedule and then a recap after the convention. So…busy year. Hopefully I can keep getting out there and speaking at events. If you are interested in having me speak at one of your events, contact me directly at buddy@buddyscalera.com. Thanks for checking out my stuff. 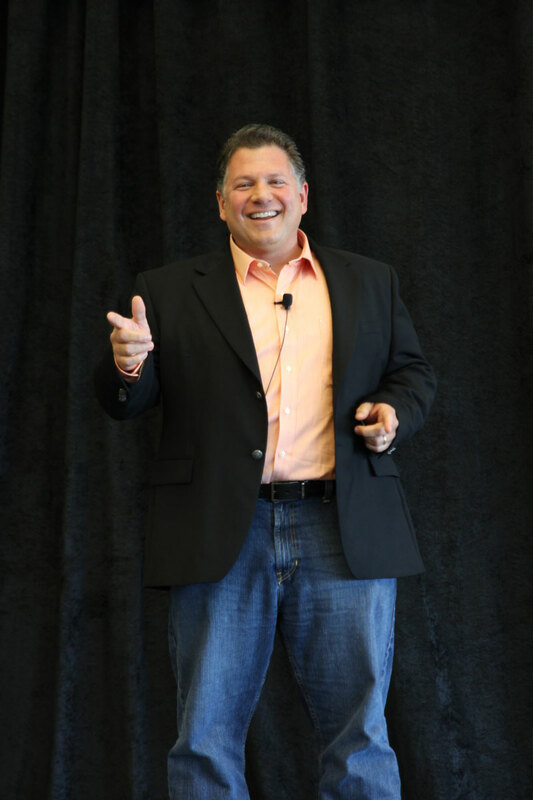 For ongoing updates or to book me for an event, check out my Speaking & Events page. This entry was posted in Brand-You, content, content strategy, creativity, Healthcare, Marketing, presentations, Speaking, Story, visual content marketing and tagged conferences, content strategy, events, Marketing, PR, presentations, public speaking, speaking, visual content strategy by Buddy_Scalera. Bookmark the permalink.